It’s been a tough few weeks for Australia. In the midst of the ongoing media frenzy about the Adam Goodes affair, it’s easy to lose hope in the sea of vitriolic racist hate that’s been populating the media. We’ve seen it on mainstream channels, in the papers, and everywhere on social media. The booing of Adam Goodes, the way that people have attacked Goodes’ simple response to the teenager who called him an “ape”, and the general denial by much of the Australian public about what constitutes racism is enough to make anyone worry about the future of Australia. Certainly, it’s enough to make everyone here at CCC take stock of their own social circles, and many a conversation has been had over coffee of late, wondering how best to deal with this incident and the constant reminders we get from our Indigenous friends and colleagues about the ongoing racism they experience in their everyday life, mostly by people who are totally unaware they are being racist. It seems that of us all, Adam Goodes has the answer. He took a moment to step back from the limelight, to remove himself from the situation. Perhaps he did this only for personal reasons, tired of being targeted by the narrowest-minded of the mob. Or maybe he realised that by drawing attention to the incredible damage that this kind of mob racism can do to an individual, he was inciting the debate about why it was wrong, and what we must do to change it. We commend Adam Goodes for his mettle, and for his confidence in himself as a player and a role model for Australia. He didn’t stoop to the level of those abusing him, he stood tall and made a silent statement about racism in Australia that got people talking and thinking about an issue we too often ignore. Working in the industry that we have, the staff and trainers at CCC have seen a lot of racism. Some is overt and in your face by people who have not been able to deal with cross cultural events in their life or have been indoctrinated by their families’ inability to deal with them. Much of it is latent, subtle and totally not recognised by those who by their actions or their words perpetuate a long-held view that Aboriginal people are not as smart, as capable, as “human” as the rest of Australia. Even more difficult is structural racism that permeates all our organisations and structures, particularly the internal aid industry that has been created to save Aborigines by turning them into facsimiles of us. In many areas, it’s part and parcel of people’s attitudes to working or living with Aboriginal and Torres Strait Islander people and stems from a total lack of knowledge about Aboriginal people, their culture and their history. In most cases its based on misinformed views and the attitudes that then develop about the cultures and habits of Aboriginal people. In the worst cases, it expects to be supported by nothing more than hateful generalisation, and the idea that settlers to Australia have only improved the lives of those around them, end of story. In all its forms, it’s a hard pill to swallow. 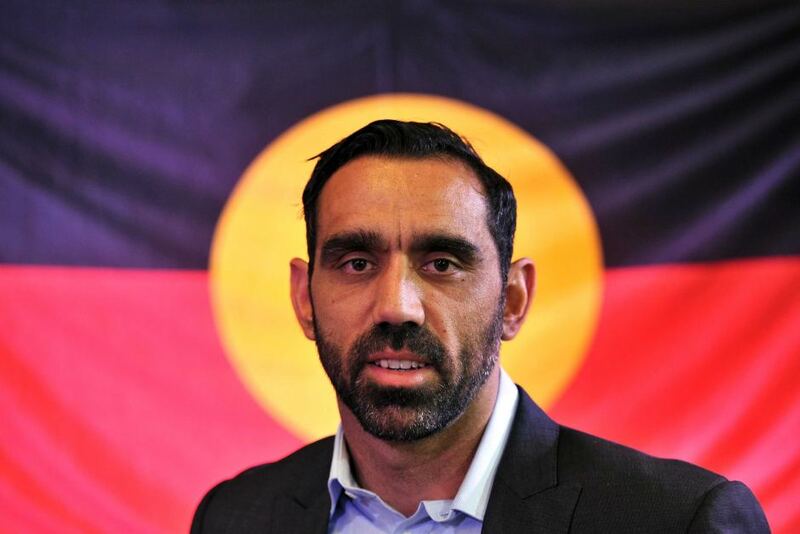 But at the same time, we are buoyed by the incredible support that Adam Goodes has received of late, and the massive uprising of Australians refusing to accept what is clearly racism, no matter what name it hides under. We can see it in the respect of Sydney Swans fans, who gave the absent Adam Goodes a standing ovation in the seventh minute of the third quarter against Adelaide, in honour of Goodes’ #37 jumper. We see it in the crowds in the stadium, where Indigenous and non-Indigenous Australians alike celebrated Goodes and showed their support. We can see it in other teams, particularly in those minor leagues around the country who painted his number on their arms or expressed their support in other ways. We see it when the Richmond Tigers and Western Bulldogs wear their Indigenous guernseys. And yes, we see it even further afield, at the Garma festival in Arnhem Land, where dancers incorporated the number 37 into their traditional dance paint to show their support. Enthusiastic barracking is part and parcel of all our sporting codes, and yes that includes booing players and umpires when we think in our loyalty they have done something to “our” team that is not fair. We have never seen such a sustained demonstration against a person who by any of our Australian values should be, and has been lauded. He is the quintessential Aussie battler. From a working class past and from a group that knows hard times to be a legend of the game and an Australian of the Year. A man who works hard for his charities and his people and a man we would be proud to call our friend.